While there are some accessories every room needs to make it look complete, there are others that can attract the wrong kind of attention. Visual clutter can detract rather than add to a home's beauty, not to mention impair its ability to function well. Here are six common accessories your home can really live without. 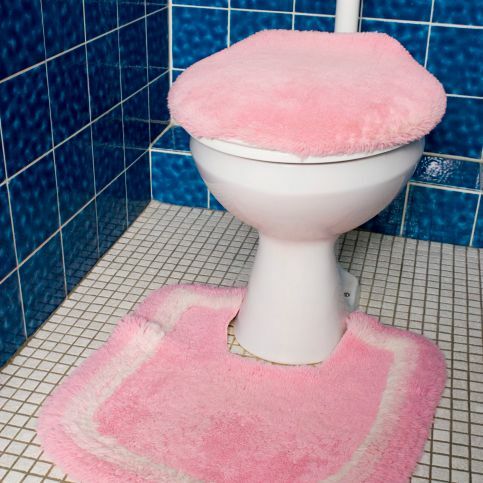 No one needs a carpet-like covering for their toilet seat lid. Nor does anyone need a matching rug that fits cozily around the base of the toilet. For one thing, these items are breeding grounds for germs and are just something extra to wash. For another, do you really want to draw attention to the toilet by decorating it? To warm up cold tile, let the toilet seat lid remain naked and place a small, attractive throw rug on the floor a little ways out from the toilet instead. Lots of mismatched picture frames hung on the wall or sitting on a table--particularly ones that are too small or are cheaply made--are distracting. Family pictures are important, certainly, so it can be hard to let go of some for sentimental reasons. Instead, select some favorites and give them a place of prominence by putting them in nicer frames and displaying them with more purpose. Create one gallery wall, for instance, or line your staircase with your favorites. Make a console table home to a handful of tastefully framed photos, and donate the rest of those frames to a good cause. Alternatively, you could spray paint mismatched frames the same color so they look more cohesive when displayed as a group. Finally, check out all of these ways to upcycle picture frames you no longer need. You may be surprised to hear that some rooms don't need curtains. There are a number of reasons you may be able to do without them. First, if you are lucky enough to live in a home with beautiful windows--perhaps you even have original woodwork--then maybe you shouldn't be covering it up with layers of fabric. Secondly, if you live in a rural or wooded area, there are some rooms in your home that don't need the privacy curtains afford and are better served by natural light. Finally, to put it plainly, some curtain choices are just not the most flattering. Take a look at your curtains. Does the print or style seem dated to you? Are they faded by the sun? Are they too short for the window? If any of this rings true for you, it may be an interesting experiment to take them down and live without them for awhile. You may just enjoy the view enough to leave your windows uncovered; however, if you want or need to replace them with something, try bamboo shades or shutters topped with a simple valance or tailored panels. Here are some important dos and don'ts of hanging curtains, and a list of great places to buy stylish, inexpensive panels to update your look. Who doesn't have a lot of these stuffed in a cupboard? Cheap glass vases are something else your home doesn't need. Get rid of them! Aim to have three to four pretty vases in different sizes to use for fresh flowers, but that should be plenty. One exception to this, however, is if you can use these glass vases for something else. Home Made Modern spray painted a collection of florists' vases white to create a collection of faux milk glass that looks great displayed in bookcases. If you're looking for ways to fill your built-ins, this could be an easy and inexpensive solution; but, otherwise, ditch the extra glassware. Some artificial plants--such as succulents, for instance--can actually look great; however, if you have any large, artificial flower arrangements in your home, chances are they're dusty and dated. This goes for fake trees, too. Since every room needs something living, though, consider a live tree, easy-to-grow houseplants, a small vase of fresh flowers, or simply a bowl of fruit on the table. If artificial plants are still the best option for you, read these best practices for decorating with faux florals, then ditch your dusty old arrangements from the 90s and start fresh with a couple of new, tasteful choices. Accessories are great--even important for adding personality to a room--but too many of them can make your home feel cluttered and messy, even when it's clean. If you have large collections with which you don't want to part, simply rotate out the pieces from time to time. There's no need to display everything all at once. Resist the urge to cover every surface with tons of tiny tchotchkes and instead, follow this fool-proof rule of thumb: choose three objects in a larger scale (rather than a lot of small things) in varying heights for your coffee table, nightstand or side table and you'll be able to cut the visual clutter and achieve a more professional look.